This is a wonderful opportunity to bring a talented pool of hilarious Front Range comics to the Western Slope. Well-established touring professional more...0 headliners that are regulars at Comedy Works in Denver will be booked for monthly showcases. 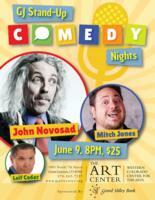 The inaugural show will be with the hilarious John Novosad headlining and Mitch Jones featuring on June 9 at 8pm at The Art Center. KAFM Life Long Learning brings The KAFM Salon. 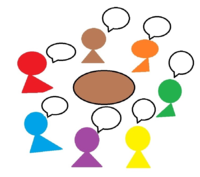 This is a once a month get together to have discussions on topics affecting our lives today. It's more...0 not about convincing others or about "being right" but a chance to share ideas with an open mind and heart. We want to explore the diversity in our community. Under the covers Project: Under The Covers Project: is a truly unique event pulling together local and regional bands and musicians to pay homage to more...0 the bands and performers who inspired them! Kicks off June 15th, 2018 MUD Primus Tribute band formed by Britt Kuntz and members of Zolopht for the Under the Covers Project at Mesa Theater! Two world class tribute acts all in one package.. This blistering two hour plus tour de force concert extravaganza pays homage to diamond recording more...0 Artists BON JOVI and JOURNEY . Two iconic, legendary bands that have ruled the radio airwaves and concert tour charts for over four decades. ROXSHOW impeccably recreates two of the biggest tours in music history. BON JOVI'S 2010 Circle tour that topped Pollstar for three years, JOURNEY'S sold out 1986 Raised on Radio tour, that was the subject of an MTV documentary and showcased the band at the pinnacle of their success, ROXSHOW has meticulously recreated both acts with an uncanny attention to detail that makes for a jaw dropping evening of headlining entertainment. .. This super group is the the MUST SEE tribute show in the business. Over 1000 sold out shows in 50 states and 20 plus countries and seen by over 3 million people worldwide. Also available separately as individual 90 minute shows and in an acoustic format. THE BAND: -DANNY WILDE (STEPPENWOLF/JY/VALENTINO) VOCALS -EDEN STOLLMAN (BOB SEGER/VIXEN) GUITAR/VOCALS -RALPH CIAVOLINO (YNGWIE MALMSTEEN) BASS/VOCALS -STET HOWLAND (WASP/METAL CHURCH) DRUMS/VOCALS -BARRY ALLEN(TOTO/BOBBY KIMBALL) KEYS/VOCALS.